At last, an orchestration book tailor-made for the classroom musician on a budget. Any teacher, student or professional musician, whether a composer, orchestrator, arranger, performer or enthusiast will find this thoroughly comprehensive dictionary full of the most needed information on over 150 instruments. 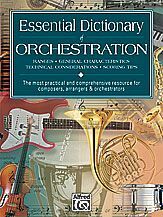 Designed for quick and easy reference, the Essential Dictionary of Orchestration includes those much-needed instrument ranges, general characteristics, tone quality descriptions, technical pitfalls, useful scoring tips and much more!